The Latest Headlines and our Upcoming April Today’s Specials: Maximum Essential Omega-3 and Ultimate Eye Support…plus Astaxanthin. First of all, I must apologize for the long delay between blog posts. I enjoy writing articles for my blog, but because I do it personally (no ghost writer), my recent increased workload at ProCaps Labs has left me with little or no time to write blog posts. We are working on putting together a portable video setup, so I will be able to record video blogs quickly, wherever I am, that you can watch or listen to anywhere at your leisure – whether on your phone, tablet, desktop, laptop or even your TV. Again, my sincere apologies for the lack of blog posts, but I am happy to have finally found some time to sit down and write this article, which will briefly discuss the latest very controversial headlines about some vitamins found in retail stores and of course, also introduce you to our exciting, upcoming April Today’s Specials. So let’s start with some of these crazy headlines of late that would have you believe that all botanical products sold in major retail stores do not contain the ingredients promised on the label and might also contain a wide range of undeclared and undesirable contaminants and allergens. Sounds pretty extreme to me, and although the supplements sold at retail in mass market stores have never been my favorites in terms of their quality for any number of reasons, in this case, I think there may be some misleading headlines resulting from an overzealous and misinformed NY Attorney General. The story is still developing but it seems peculiar to me that apparently the NY Attorney General has refused to share his “science” or data with the companies whose products he so publicly and freely disparaged. In the prior sentence I put the word “science” in quotes, since instead of using the established testing methodologies of USP or other regulatory bodies that would be viewed as valid by FDA, USP, NSF or others, this NY Attorney General used an unproven and ill-advised “DNA fingerprint” test to identify ingredients in these botanical products. Clearly the NY Attorney General did little research himself and has little or no scientific background, or he would have performed tests deemed valid by the FDA or other regulatory bodies. Also, the NY Attorney General would have realized that DNA is among the most fragile and delicate component in any living material, and in most cases would be completely removed or destroyed when creating a standardized botanical extract. In other words, he was looking for something that would not be found. In short, if one did this silly DNA fingerprint test on the world’s finest botanical extracts, one would likely find no DNA fingerprint at all from the source plant; however, if one performed a more sophisticated analysis using HPLC (high performance liquid chromatography), the product would pass with flying colors, exhibiting all the key targeted protective compounds derived from the source plant. When you consume a botanical extract you seek the important beneficial, protective compounds and not some random residual fragments of damaged DNA. For example, if one looked at the best extracts in the world delivering beneficial compounds from botanicals, such as EGCG from Green Tea Extract or Anthocyanins from Bilberry Extract or Proanthocyanidins from Grape Seed Extract, one would likely not find the DNA from the tea plant or the bilberry plant or the grape plant. You would be using the finest extracts in the world, but it would fail a test that has nothing at all to do with the quality of that extract, which simply begs the question, “why would the NY Attorney General use such an invalid protocol (when there are proven, valid and accepted tests available) and then promote and disseminate the results in a fashion that would end up making headlines in every media source in America?” It seems to indicate another agenda or some bad judgment or ethics or all of the above; however, I will leave the answer to that question to you. But we are not done with this story yet, since the NY Attorney General also claimed that these products were contaminated and adulterated with all sorts of undeclared ingredients and allergens. Once again, it was the DNA fingerprint test that supposedly found all sorts of undeclared contaminants, adulterants and allergens in these products; however, it is my understanding that this DNA fingerprint test did not give any indication of quantity, so it could have been trace amounts in the level of parts per million or less. Mind you, I am not trying to defend these retail mass-market products, since I have never cared for their ingredients and additives nor their manufacturing methods, but this DNA fingerprint is not how you criticize or validate the contents or the quality of a botanical supplement. In closing, it seems as though a NY Attorney General who apparently had little knowledge of the supplement industry achieved major headlines using testing methods inappropriate for the conclusions drawn. Interestingly enough, there are numerous established testing methods he could have used, but for some strange reason he chose not to. Lastly, as much as these headlines were misleading and exaggerated, it should only provide further confidence in ProCaps’ products due to our total absence of additives and rigorous in-house testing and analytical methodology. Our singular focus is the “Purity, Quality, Integrity and Effectiveness” of every formula we make. Those are the words I carefully chose and decided to put on every bottle of my product for 36 years and it is fascinating how important those words are today. Speaking about purity and quality makes for a perfect transition to this weekend’s Maximum Essential Omega-3 Today’s Special. Our Omega-3s have always been unique in a number of respects. First of all, we only use fish that have been harvested in an independently certified environmentally sustainable fashion. We also ensure purity that exceeds the highest standards of any world regulatory body. We then make sure that our products only contain the natural form of Omega-3s rather than the synthetic form used in most products. We also focus on the most important of the Omega-3s – DHA, and still provide high levels of EPA and other natural Omega-3s. Lastly, we have mastered the ability to deliver the world’s finest Omega-3s without any fishy aftertaste, repeat or stomach upset. In short, there is no better Omega-3 supplement in the world. In fact, as good as it is, we just made a subtle improvement to the formula, since we were able to deliver the same ideal amount of 500 mgs of Omega-3s per capsule and significantly reduce the size of the capsule, making our already easy-to-swallow capsules even easier to swallow. Even better, it is available at our best pricing ever and with free shipping and handling. I probably do not need to emphasize the constantly expanding research on the benefits of Omega-3s. However, the science continues to grow dramatically with thousands of published articles attesting to the myriad of benefits from a diet rich in Omega-3s or their intelligent supplementation. Moreover, the research is unequivocal regarding the superiority of our natural triglyceride form of Omega-3s and our emphasis on DHA. When I first introduced Omega-3s over 30 years ago (long before most companies), we were focused on heart health, but today the critical role of Omega-3s in brain and eye health is absolutely inescapable. In fact, there are dozens of studies discussing the role of Omega-3s in postponing or reducing age-related changes in memory and mental function, as well as promoting positive mood and outlook. This is the kind of news that should find everyone consuming cold-water fish or a quality supplement. Also, and not surprisingly, given the fact Omega-3 DHA is most highly concentrated in the retina and macula of the eye, there are a multitude of studies attesting to the role of Omega-3s in protecting against degenerative changes in the retina or macula of the eye. This is even more scientific encouragement for us to embrace a diet rich in healthy fish or an intelligent supplement. Sadly, an intelligent Omega-3 formula is not that easy to find, since the typical formula contains poorly absorbed ethyl esters and lower levels of all-important DHA. Making matters worse is the fact that ordinary supplements typically offer a fishy aftertaste or cause an upset stomach due to their inferior ingredients and composition. As I have said before, if you would like to feel great about taking Omega-3s, all you need to do is glance at the research. The more you know, the healthier you will become, so I am happy to help you find the research. There is no need to believe me, since the research is so clear and compelling. Three decades ago, I was already excited about Omega-3s, but today, the research is 1,000x more compelling. If you want to be as convinced, just go to the National Institutes of Health website at www.pubmed.gov. At the search box, you can type in the words “Omega 3 and Heart” or “Omega 3 and Brain” or “Omega 3 and Eye” and you will find many thousands of results. If you type in a search for Omega-3s combined with health conditions, such as Heart Disease, Stroke, Depression, Dementia, Alzheimer’s Disease, Macular Degeneration, Diabetes, Hypertension, High Blood Pressure, etc., you will find hundreds, if not thousands, of research results. In short, Omega-3s are now a serious scientific and medical focus. Also, I have been offering them for over 30 years, so they are not a recent fad, but a respected essential nutrient that is terribly deficient from the American diet. My passion for discussing them comes from the knowledge that they can make a profound difference in our health. So please try to tune in this Saturday at midnight and all day Sunday, when I will introduce our new, even easier-to-swallow Maximum Essential Omega-3. There is no other Omega-3 formula like it available anywhere. Our products provide a natural balance and form of Omega-3s that are also contaminant-free, sustainably harvested and that always come in small, easy-to-swallow capsules that will never leave a fishy aftertaste or cause an upset stomach. By the way, we also make an exceptional Krill Oil product, which although excellent, does not contain the same high potency of Omega-3s present in our Maximum Essential Omega-3. Even the best Krill Oil contains much lower levels of Omega-3 and possesses 1% of the research of fish oil. Ultimately, along with the science, nothing speaks more clearly than the voice of those who experience our products and with well over 1,900 5-Star reviews, it is rated an almost perfect 4.7 Stars. It is hard to believe that a fish oil formula can be so perfectly loved, since most folks love to hate their nasty Omega-3 “horse pills”. I am proud that everyone loves our small, mild, easy-to-swallow capsules, which have gotten even smaller and, of course, have absolutely NO fishy aftertaste. I look forward to seeing you this weekend and I will write a blog post next week prior to our Ultimate Eye Support Today’s Special. 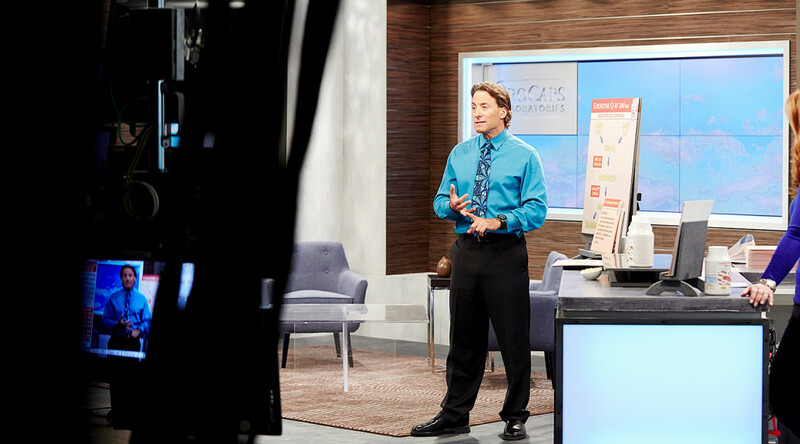 I will also mention it on-air this weekend, since one cannot discuss Omega-3s and eye health without talking about the two vital optical pigments (Lutein and Zeaxanthin), which are essential for vision and, like DHA, are all concentrated together at their highest levels in the retina and macula of the eye. I will elaborate further next week and in my next blog post. I hope to see you this weekend. Previous PostThis Weekend: Our First Live Shows From Our New Studio Inside Our Nevada FactoryNext PostThis Weekend, The Eyes Have It! Protecting The Most Precious of Our Five Senses. Andrew, I have purchased your vitamins for over 10 years. I do quite a bit of research myself and I have Vitiligo which has no cure so I try to exercise, eat healthy and supplement as it is an autoimmune disease. I would like you to address the recent news that Vitamin D supplements or a hoax and a waste of money. They had physicians quoting studies on all major news stations in the past month. Many sources say autoimmune MAY be due to Vitamin D( and Vitamin B12) deficiency as we do not process those correctly. Also I wish I lived closer as I think working for your company would be wonderful! I also have an autoimmune disorder. Please read the book Immune Solution by Amy Myers MD. It has changed my life. I no longer take any medications, however I take Andrew’s Supplements for years and many of the same supplements are recommended by Dr Myers. Thank you, Andrew. I am turning 50 this year and have been taking your supplements since I was 32. I sincerely believe that your Omega 3 product has helped me navigate through life’s ups and downs much more easily. I rarely feel depressed, even at times maybe I should – and that is not something I could say in my 20s. I also really believe the Omega 3 and your other supplements help me with problem solving. And this is just one of your products! God bless and thanks for all that you do. Lifelong customer here! In stocking up on vitamins I have overworked and some even unopened have expired . Do they become unusable after date shown. Call ProCaps directly. Their customer service will answer your question regarding each supplement individually. When I had a similiar question, they helped me out. Hello Andrew. Thank you for helpful updates on your blog. A particular area my husband & I are dealing with is joint pain. I think your glucosamine chondroitin product is helping somewhat because we are both mobile and function day to day, but with a problematic knee, I am finding myself looking for more info. I have been reading about other natural ingredients that help relieve joint pain, such as: Boswellia Serrata, a patented type of undenatured collagen called UC-II, Resveratrol (we take this as well), and an extract derived from black pepper called BioPerine. Other than Resveratrol, are you familiar with these ingredients? I respect your dedication to providing quality ingredients and quality processing of your products. I am hoping you will be looking at providing your customers with more joint options in the near future. Thank you so much! Please try Montmorency tart cherry juice (or chew 2X daily the Eden brand dried cherries) for joint pain–my mailman takes it for gout and people with arthritis or other joint pain find relief–it must be the so-called pie cherries, though: tart pie cherry juice or dried cherries. Note that these are not sour, but sweet and entirely palatable/edible. So much better than taking drugs! You can either buy the concentrated juice and dilute it or drink it straight, about 2-4 oz daily. More joint support ingredients: Hyaluronic Acid and Turmeric. We take Turmeric, but not sure about Hyaluronic Acid as an oral supplement. And I am concerned about quality processing of supplements, so most of our supplements are from Andrew Lessman! I have heard that taking niacin can be as effective as taking a statin…what are your thoughts? I was told that taking Omega 3’s increases your cholesterol level. Is this true? Kaiser Health Care, the largest health care provider in California, recommends Omegas for reducing blood cholesterol. Doctors there suggest taking other sources too including flax seed and nuts – simple things like adding a tablespoon of ground flax to your breakfast cereal and eating a small handful of walnuts as a mid-day pick me up. The actual scientific studies that I have read indicate that Omegas also reduce the inflammation associated with “bad” cholesterol accumulating in your arteries. Because inflammation is now associated with a myriad of other (most?) chronic diseases, including cancer, I would go with Omegas. For my eyes , your supplement and also ultimate eye support as well as astarsaxin….for osteoporosis the complete calcium, magnesium D3. Fordigestion digest assured if needed. Morning starts with Q10, vitamins and omega. When my legs swell your pills at night are great and when my knees hurt glucosamine with condroitin acts fast. So thanks a million for keeping me young. Bought your cholesterol pills a while back and to make a long story short, I went from 335 to 204 on my number. now I did lose 22 pounds in 20 weeks, but I think along with that and the pills it went dow a lot !!! I lowered my cholesterol from 325 to 204 taking your cloesterol c are. I also lost 22 pounds in 20 weeks witch I think together with the pills did the trick. Thank you! Great blog, welcome back Andrew! We appreciate all of your good information you provide and look forward to the videos! I want to buy several of your products totaling $1,200.00 dlls. I would like to know if I would get a discount or flexible pay and also how much I will be paying for shipping and handling. My home phone number is 561-625.8776 I have been taking your vitamins and supplements for over a decade. Leticia “lety” garriga. When you purchase through HSN when Andrew has a “Today’s Special”- All of his supplements go on sale with no S & H. You’ll find flex-pay on all of the larger size bottles as well. It’s when I stock up on my Andrew Lessman items. Andrew, your blog about the NY Attorney General is timely as I had just heard the story and was concerned why it should take his office to discover irregularities. Your explanation why DNA testing is not appropriate makes sense. I appreciate what you’ve done in using the purest ingredients in your vitamins and supplements. I had never heard of Astaxanthin until I caught your show on HSN over a year ago. I decided to give it a try since I’m very nearsighted and have had a retinal detachment and floater issues in my left eye. I take it along with Lutein (25 mg) and Zeaxanthin (5 mg) daily. I recently had an eye exam as I kept closing my left eye to see things clearer. The doctor reported that’s because my prescription was too strong as my vision has improved in that eye from 10.25 to 9.75. She said that’s not uncommon as we get older (I’m 60 yr old), but taking the supplements sure didn’t hurt, especially when my vision improved in my weaker eye! Thanks for alerting people to this great supplement! Andrew… I was wondering why your capsules do not have any identification on them. I thought it was required. I would love to suggest this. When I pour them out of the large bottle ( I take many of your supplements) , for example travel, I have no idea which ones I’m taking . Isn’t there a way to put an ID # on them? Thanks Andrew for your quality . I agree, this would be quite helpful! Please make a vegetarian version of your Omega 3. I do not eat fish or fish oil. Thanks. My advice is don’t stock up. I ordered an 800 count of Omega 3 last year when I still had a supply from a previous order. Andrew, you and HSN salespeople encourage customers to stock up, so I did. To my surprise, when I opened the container after using the first supply, the smell was terrible and the capsules were all stuck together. The date on the container is 2/28/2017, so the caps should be well within the freshness time period. I have to pry the stuck together caps out when I use them. I called HSN and your Lab, to no avail. I had stored them in a bedroom, so they were not mishandled by me. The only thing I did wrong was not to check them when they arrived, thinking that they would stay fresher if unopened. I hope I will be able to “pry out” enough to make my very expensive investment worthwhile. Andrew, in a world of such confusion about supplements, You are refreshing! I am thankful that you continue to stand strong in your convictions and research for Quality. Keep your focus , certain agencies, etc. try to attack the very work you are doing. Andrew, love the Omega 3 , and other of your formulas. I am always looking for those who take the time to care, this is who you are Andrew, Many , many people love you Andrew. I am one of them. I take many of your vitamins the one I started taking was for my eyes ! Is it possible to make a vegan version ? My Dr told me to stay away from Soy..
Do the Ultimate Eye Support reduce or prevent cataracts? Your Omega 3 is completely different from at least two others that I have tried. I started with Omega to fight RA and your Omega and only your Omega has made a difference on my joints. What is amazing, after 10 days of your Omega, I noticed a remarkable difference in my hair. And it wasn’t just me – my hairdresser too. My has is very thick but dry and the Omega has added a silkiness that I have never had before. Your Omega 3 is expensive and I have tried two others in an attempt to save money but the other two did not have the same results. Thank you so much for bringing this product to the market and helping me. Andrew, I love your products and look forward to seeing them on HSN. I wait on your free shipping because like others, it helps when you do not have to add more expense to the amount. I tell everyone about your products and try to get them to change to yours. Thank you for making products that are good and safe. I use the omega with mint and don’t like it too much mint every time I burp it’s the omega with mint . I also stock up on large size of vitamins and also end up with bad smelling vitamins for example the hair nail and skins vitamins . Breast vitamins and compete vitamins for women. Please write more about the story of the “DNA fingerprint” testing. Some said that, GNC has agreed to add DNA testing to its quality control procedures. If DNA is not the right way to do the test, what was GNC agreed to? Why? In what way? Which organization in USA has the authority to watch over the whole billion dollar vitamin and botanical product industries and control the qualities? Do you have some published third party lab testing results for your products? Love your articles. Please keep them coming. Thanks. I am wondering how one knows if they are taking too many supplement’s and vitamins. Can I get to much of your great products.? I have lost 100 Lbs, over the last 10 year 50 last year. I use the 50% fruit and 50% veggies in my bullet add 2 scoops of The whey and 2 tablespoons of flax seed. Add 8 oz of Silk coconut milk, an turn it on. This makes 2 meals for me. Wondering your thoughts about research and headlines stating that Omega 3’s are only beneficial from actual food sources and NOT supplements. ; even stating that they could be harmful via supplements. I was wondering about an omega from a plant (Seaweed) source not a fish source, is it more sustainable than fish source? Also do you have anything on the horizon for a SOD (cucumis Melo L.) supplement? I think this time around I will try the Carnitine supplement to help my body composition. Thank you for having specials! Andrew, I posted on the Facebook page that it would be very helpful if you had a chart of the supplements you take every day. Or, if that’s too personal, and realizing that all nutritional needs and ages are different, please post what you recommend the minimum of what people should take everyday. Finally, there should be a chart or program, similar to what pharmacists have, that warn you when you are taking too much of the recommended dosage of a particular supplement. Too much niacin, for example, can cause liver damage. I’m sure the last thing you want is for people to get sick from taking your supplements. But with so many different products, and many of then containing the same nutrients, people could be taking dangerous levels of them. Thanks for listening! I agree, as for doubling up on ingredients. As I read the labels of Andrew’s supplements, some are repeated in different products. Other than a multivitamin, CoQ10, Omega-3,Vitamin-D what else is really necessary for living healthier? Without spending a fortune? I take soooo many of your vitamins and try to space them out through the day. Is it ok to take several (I mean between 5-10) at one time? I don’t want to take too many and my body can’t absorb them and they just pass right through! There just aren’t enough hours in the day to get them all in if I don’t (especially since many say to take with food). Also, do you offer any supplements for hearing? I read something about an ingredient called vinpocetine being helpful…I know nothing will cure hearing loss but anything that might help would be great! Andrew: My doctor has advised me that I may have the start of macular degeneration in both eyes. He wants me to take “Zeaxanthin”. I am already taking your “Ultimate Eye Support”, which does have “Zeaxanthin” and “Lutein” in it, and do not know if it is enough . You only have a supplement called “Astaxanthin”, which does not have any “Zeaxanthin” or “Lutein” in it, which I am also taking. Are you going to be producing a “Zeaxanthin” supplement in the near future? Thank you for all your good help, research and advice regarding the vitamins. I like most of you, have been using Andrew’s vitamins before he even came to HSN and feel I have bought many of those blue shirts n ties! But still the best money I ever spent and not guilty that it has been on myself and my sons ! I found this interesting. It seems Columbia is tired of Dr Oz too! The main reason I ordered the HSN TSV , Maximum Essential Omega-3 ,was because it was stated in Andrews blog “we just made a subtle improvement to the formula, since we were able to deliver the same ideal amount of 500 mgs of Omega-3s per capsule and significantly reduce the size of the capsule, making our already easy-to-swallow capsules even easier to swallow.” The new pills are NO different in size than previous orders. Quite a disappointment. I bought the Fish oil tablets last year on HSN. You offered a special that included a 720 tablet count. Are you doing that again anytime soon? I am almost out.